On the right, an artificial atom generates sound waves consisting of ripples on the surface of a solid. The sound, known as a surface acoustic wave (SAW) is picked up on the left by a “microphone” composed of interlaced metal fingers. According to theory, the sound consists of a stream of quantum particles, the weakest whisper physically possible. The illustration is not to scale. Image: Philip Krantz, Krantz NanoArt. Most quantum research is focused on studying interactions between light and atoms, a field known as quantum optics. Researchers at Chalmers University of Technology in Sweden took an alternate route and demonstrated for the first time that acoustic waves could be used to communicate with an atom. 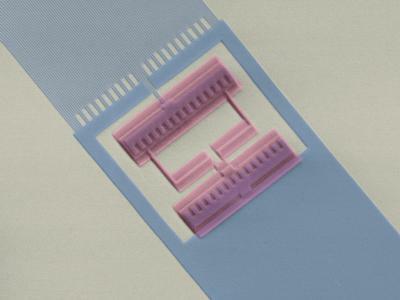 The findings could provide an important stepping stone for harnessing quantum effects in the ‘real’, macro world with potential applications in quantum computing and more. The quantum electrical circuit that the Swedish scientists built essentially acts like an artificial atom – it can become charged with electricity and release particles, just like a regular atom, as described in the journal Science. While other projects have successfully demonstrated artificial atoms that release photons (particles of light), this is the first time that such a quantum system was shown to emit and absorb energy in the form of sound particles. The device they employed is made of a substrate of gallium arsenide (GaAs) and contains two vital components: a superconducting circuit that constitutes the artificial atom and an interdigital transducer (IDT), which converts electrical microwaves to sound and vice versa. The sound waves used in the experiment were surface acoustic waves (SAWs), which can be visualised on the surface of a solid, while the whole demonstration was performed at very low temperatures, near absolute zero (20 millikelvin), so that energy in the form of heat does not disturb the atom. The low temperature is also essential to make materials exhibit superconductive properties. Superconducting materials can conduct electricity with no resistance, which means that they can carry a current indefinitely without losing any energy. Such materials are considered to be part of the new suit of electrical technology set to change the world in the future – that if scientists can find a way to make them work at near room temperature without them losing their properties. Because the particular sound waves used in the experiment travel a lot slower than light (100,000 times slower), scientists can better control the quantum phenomena involved. This is because an atom that interacts with light waves is always much smaller than the wavelength. However, compared to the wavelength of sound, the atom can be much larger, hence it can be controlled easier.